Part of my Mother’s Day was spent doing what I love best: reading outside on my sunny deck with the sounds of birds and lawnmowers and laughing children in the background. 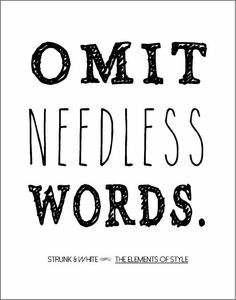 My book of choice this afternoon was Elements of Style, written by William Strunk and E.B. White. (Yes—the one and only E.B. White. The one who gave us Charlotte’s Web.) Strunk was White’s English professor in 1919 at Cornell University, and this little book was one he privately printed and passed out to all his students. 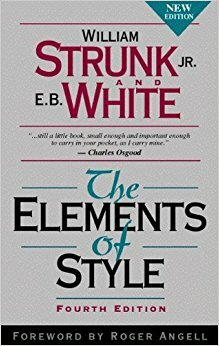 It didn’t actually get published until after Strunk’s death (Strunk died in 1946; the book was published in 1959, with an introduction penned by White—since then, it’s never gone out of print). The tiny book is all of 85 pages, and as I work through it (slowly, thoughtfully chewing on each delicious morsel), each page uncovers another little gem about the craft of writing. As I read the book, this handbook for writers is a handbook for life, too: Communicate your purpose clearly. Get rid of the unnecessary. When telling your story, speak in specifics over generalities. Omit. Then omit again so the good stuff can shine through.